The family is the most important institution in the world. It is the cornerstone of our society and an incubator for the future generations. It is important to take care of this institution. Our future depends on it. I believe that we need to apply some basic bible principles of love, collective work and responsibility and faith. I compare this to a well-oiled basketball team. All the great teams have the same thing in common. Each player cares about the other. The work is shared and everyone wants to do their part. The group also believes in each other and the cause that they are going for — whether it be the championship or striving for the good life. Each member of the team or family plays an important part. The guards are the first line of defense on one side and the initiators of the offense on the other side. The forwards attack and defend the baseline of the goal and the center brings balance. 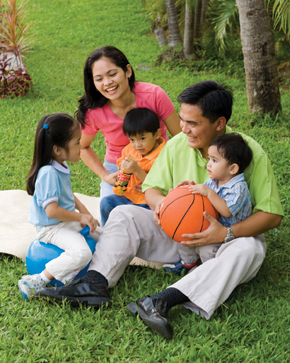 In a family of five, one scenario could be a strong wife (point guard); oldest child (shooting guard); the other two kids playing the forward positions and the dad is the center. Problems occur when some members don’t feel like they are a part of the team or choose not to hold up their end of the bargain. Family commitment is important and this is a good time to recommit to the health and welfare of the family. Parents need to believe it! Children need to see it! And the world needs to follow the example!